Get a sneak peek of her fictional alter ego for 'My Korean Jagiya,' too! There doesn't seem to be a week when Heart Evangelista isn't flying off to an exciting destination! This month, aside from attending Haute Couture Fashion Week in Paris, she's filming scenes for her upcoming television drama My Korean Jagiya in—drumroll, please—South Korea! While we don't know much about the plot, we do know that Heart plays Gia, a woman who seems to have a penchant for very whimsical outfits. But whether she's the jagiya (a Korean term of endearment akin to honey/darling/sweetie) or there's actually an oppa as the titular character, only time will tell… We're leaning toward the latter though! 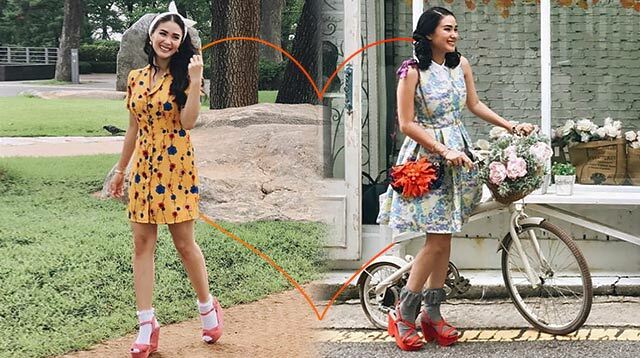 In between taping, Heart made some time to see the sights and snap tons of OOTDs along the way. Here, the actress took a coffee break, rode the subway, and visited Namsan Park in a flared black tunic vest, cropped and cuffed jeans, and chunky heeled slides. A total pro when it comes to accessorizing, Heart accentuated a classic blazer-tee-jeans combo with a jeweled Gucci belt and several stacked rings. Climbing the many staircases and steep pathways leading up to N Seoul Tower is no joke. Heart somehow got it done while clad in a sheer belted tunic, skinny jeans, and ultra-high Louboutins, no less! Of course, the view of Seoul and the colorful love locks at the top make it all worth it. Trust Heart to make something as casual as a pair of flip-flops look elegant. For a photo op with a massive version of Brown, the LINE bear, Heart dressed up her Havaianas with a crisp white shirtdress and her signature Hermès Kelly. Seoul is crawling with the most photogenic cafes and boutiques, and places like this flower-strewn room is the norm. Don't you think Heart's blush Dolce & Gabbana coat and matching Charlotte Olympia pumps perfectly complement the gorgeous setting? Shopping in Myeong-dong is essential in any Seoul itinerary! In between racking up purchases, most people fuel up by trying the street food in the area. For a day of shopping and eating, Heart opted for a polka-dot off-shoulder blouse, oversized sunnies, and neat boxer braids—no doubt to combat the sweltering summer heat!